Apologies for the lack of posts last week. While I love blogging, my work during the week pretty much restricts my blogging time to only weekends. This can make things a little hectic trying to squeeze in all of my runs, chores and a week’s worth of blog posts in the span of 2 days. Last weekend, I felt like I needed the time to really decompress, but I’m back now! Rather than share 2 week’s worth of workouts (which would probably be pretty boring), I wanted to touch on some highlights and my thoughts about the Half at the Hamptons being THIS SUNDAY! Two weeks ago, I had my last long run/hard workout on Saturday and it did NOT go well. The workout was 3 mile warm-up followed by 3 x 2 miles at 7:32 with 2 minutes rest between sets and a 3 mile cool-down. I knew it was going to be hard, but I can honestly say I wasn’t dreading this workout. I made sure to get a good night’s sleep and I felt ready to tackle it in the morning. The only bit of trepidation I felt was in that I was visiting my family for the weekend and the roads around my hometown are hillier than my typical running routes around my apartment. I knew it was going to be a struggle running 7:32 pace with hills thrown in. Boy, was I right. I picked the least hilly area I could find, which still included 2 short but steep-ish hills. I went into the 2-mile repeats and knew pretty much right away it was not going to be a good day. My first set was 7:39 and 7:57 but then I fell apart even more on the second and third sets. I felt like I was working hard but I was literally GASPING for air and could NOT make the pace on my watch nudge down to the low 7:30s. Mentally, I was frustrated and already beginning to have doubts about the half. It was, by far the worst workout I have had this entire training cycle. I ended up chatting with Mary (my coach) the next day, and she reassured me that this happens and is not the end of the world. One bad workout does not undo 3 months worth of good workouts. I felt 100 times better after talking it through with her, and I don’t think this workout will negatively affect my mindset going into the race this weekend. 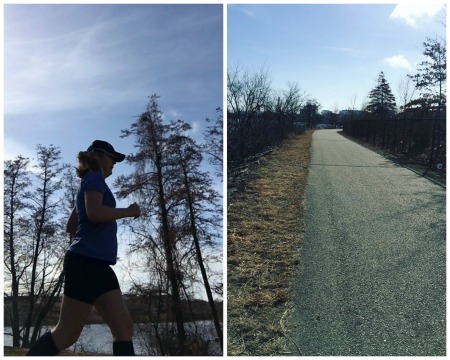 This past weekend, I had an easy 8 miles on Saturday in beautiful mid-60 degree temps which was GLORIOUS! Nothing like wearing shorts on February 25th! This week I have a few more easy runs on the agenda, but nothing too crazy. How was your week? If you’re in the Northeast, were you able to get outside and enjoy this amazing weather? How do you react to the taper? This entry was posted in Uncategorized and tagged 2 Generations Running, Half at the Hamptons, Half Marathon Training. Bookmark the permalink. I can totally relate where one “failed” workout is defeating, frustrating and disappointing. But your coach sounds just like my coach; one difficult workout doesn’t take away from all the other awesome workouts you have had! You’ve been putting down some great runs lately! And what matters is throwing down on race day. (By the way, your coach isn’t Mary Holt Wilson is it?) I LOVE LOVE LOVE the course up at Hampton. I’ve done a bunch of halfs up that way and love running along the coast (although it can get a bit windy.) So this Boston weather; um I had a somewhat “failed” workout on Friday due to the temps being what, 40 degrees higher than normal? Had 10 miles with 8 at 7:35-7:45 and I was on the struggle bus. Had to walk after each mile, was SO overheated. Then Saturday I had an easy 8, and thank goodness for the cloud cover and wind to cool me down. I wish you lots of luck at the race next weekend. I think you are going to kill it given your training so far! Aww thank you for the kind words! At this point I’m just really excited to race and see what I can do! My coach is Mary Johnson with McKirdy Trained. Yes that warm day was CRAZY! I was actually really happy not to have a tough workout that day, I was sweating enough doing my easy miles! A LOT of time, I nail my entire training segment and fall apart on a key workout in the last few weeks. I feel like when that happens, I end up having a GREAT race. I swear. So you are on track to KILL IT! Besides that quote is so true – one bad workout will NOT undo three months of good training. It will, however, cause you to start your race more reserved, not to out too fast and save some energy for the kick 🙂 Promise. You got this!